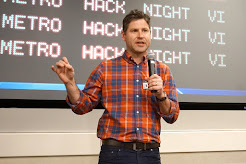 What do General Motors, Samsung, and Duke and Ohio State universities all have in common? They have each launched bikeshare systems in the past year brought to them by Zagster, a private, venture-funded startup that launched as CityRyde back in 2007 in Philadelphia. Visiting Cleveland, Ohio this week for the Content Marketing World conference, I got my first taste of Zagster, which opened last summer in the city. I knew nothing about this company or that Cleveland had a bikesharing network. I simply stumbled upon a small stand of white bikes as I wandered around the city’s Warehouse District to the west of downtown, where my hotel and the conference are happening. 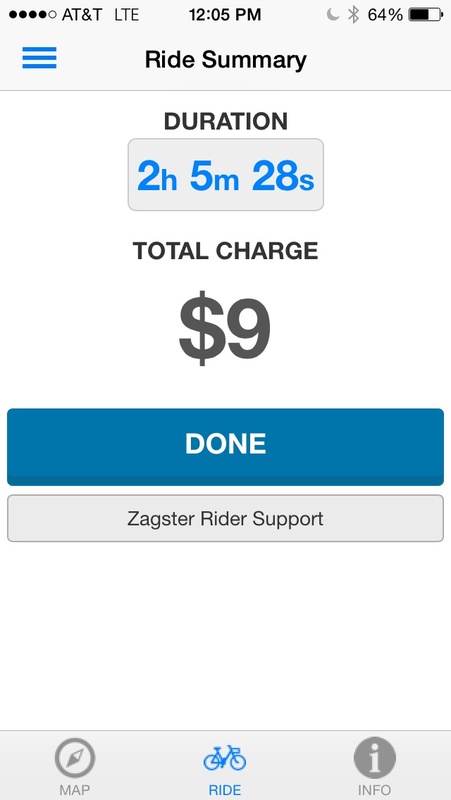 It couldn’t have been easier to download the app and sign up for Zagster on my phone. I didn’t even know if there were any other stations than the one I had seen, but it seemed worth the minor effort. Turns out there aren’t that many stations yet in Cleveland (according to the app, it looks like there are eight total). In fact, I didn’t see any other ones on my two-hour ride, but I wasn’t actively looking for them. 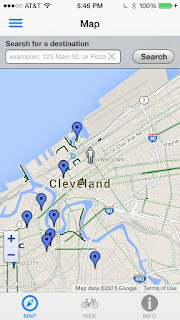 I wanted to know whether Cleveland is a bikeable city. And what I found, which is what I find everywhere, is that people should get over their irrational fears of this amazing form of travel. 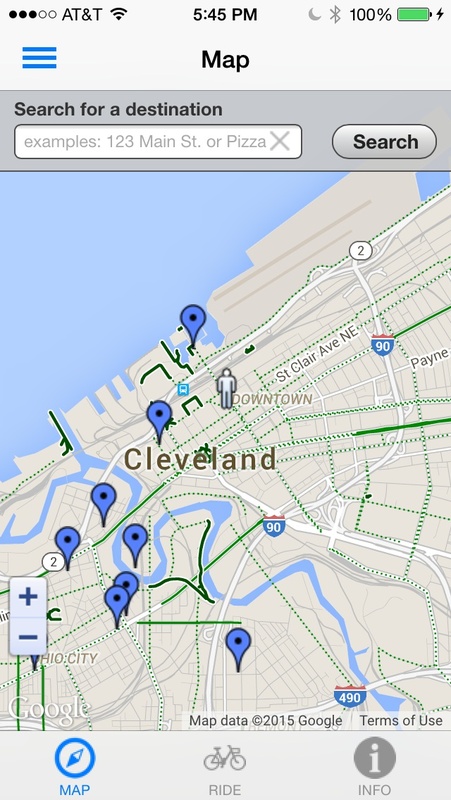 Cleveland is highly bikeable, even though it lacks much of any kind of truly progressive bike infrastructure. In two hours on a bike, I saw a handful of sites it would take two days for others to explore. My route out of the Warehouse District took me through Tower City-Public Square east along Euclid Avenue through the Playhouse Square theater district and Cleveland State University’s campus, then back west through Erie Street Cemetary and around the baseball Indians’ Progressive Field and basketball Cavaliers’ Quicken Loans Arena. The Bob Hope Memorial Bridge has wide bike and walk access and beautiful views of the city and Cuyahoga River below. After biking through the Tremont neighborhood, I had lunch at Town Hall, a very popular and tasty restaurant on West 25th Street near the West Side Market. In Washington D.C., there are so many Capital Bikeshare stations that riders always quickly return the bikes to a station before having lunch or going to their meetings. But here, I simply opened my Zagster’s lockbox to get the key for the U-lock that comes with each rental. I locked the bike to a parking meter in front of Town Hall and ate my lunch. I finished my ride by biking north on 25th, which has the nicest bike lane (although not protected) that I witnessed anywhere in the city, and east across the Detroit-Superior Bridge back into the Warehouse District. Upon returning where I had started, there were only four bikes at the station. One had a bad flat tire and another was not locked. Time will tell if Zagster will be a success in Cleveland. But there is no doubt that this system is about as easy as it gets for anyone to use. In the brave new world of on-demand-shared transportation, Cleveland and Zagster appear to be working out the kinks in what appears to be a major can’t-lose societal trend.